This is where you find all downloadable files. Click on the different sub-pages below to get the available downloads in each section. 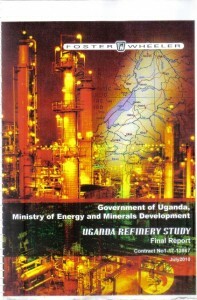 Some oil documents are free at our oil website www.newinformers.com/ugandaoil FOR the rest, you have to pay a one time fee of $500 or 800,000 UGX using the buttons below to access all the documents below and much more. You will get a password in your payment confirmation email which you shall use to sign into the website to download what you want. If the document you want not in our available downloads, tell us about it and we shall look for it and avail it for you. In case of any queries, contact us at info[@]weinformers.net or +256772627676/+256751627676 and we shall respond immediately. This is the Most coveted document on Uganda’s oil industry, the country’s oil potential and key investment opportunities and strategies at both micro, national and regional levels. The government of Uganda hired Swiss Engineering and Construction company Foster Wheeler Energy Limited (FWEL) in early 2011 to undertake a study of Uganda’s oil potential. The key goal of the assignment was to advise the government on whether to strategise on constructing a refinery or an oil pipeline to export crude oil. The aim of the study, among other things, was to recommend the optimum size, configuration, location, cost and financing options of the refinery, the attendant infrastructure and market for the refined products, as well as preliminary environmental assessment of the possible impacts of refinery development. Foster Wheeler successfully completed the study and presented a report to the Ministry of Energy and Mineral Development in August 2010. The study report weighing the different options as well as the investment opportunities in either options is the key document on Uganda’s oil industry. No wonder the government is selling a copy of the report at more than $150,000 and you have to sign an agreement not to divulge the contents there in. We bought a copy from a 3rd party and are availing it to you so you can take more informed decision as regards Uganda oil sector and potential.